Dr. Nancy Bui is the founder of DentalFlossophy P.A. since 2000. Her mission is to advocate, educate, and motivate outstanding dental care. 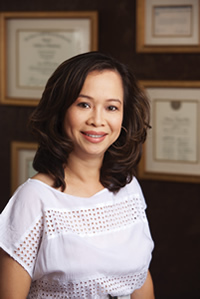 Dr. Bui has been voted by her peers as one of the best dentist in Tarrant County since 2008. She is gentle and a meticulous perfectionist who offers the highest level of skill along with a friendly and warm personality. Her patients often comment that she has a â€œbutterflyâ€ touch. Dr. Bui considers herself a native of Arlington. She graduated from Sam Houston high school then University of Arlington. In 1995, she received her dental degree from Baylor College of Dentistry. Dr. Bui is an active member of American Dental Association, Texas Dental Association, Academy of General Dentistry and American Academy of Cosmetic Dentistry. She is also active in church and philanthropic organizations. She has served over a decade for St. Joseph Catholic Charities and Texas Dentist for healthy smiles.